Why not build the bed 24 inches tall? With that much good soil you should get a good crop of potatoes. Most rabbit fencing is 24 inches. Depending on the rabbits that may be enough. A lot of soil to fill a bed that tall It would be tough digging them out later in the year as well. Just wondering mainly if rabbits tend to eat the foliage or tend to leave it alone. I can't seem to find any info on the matter. 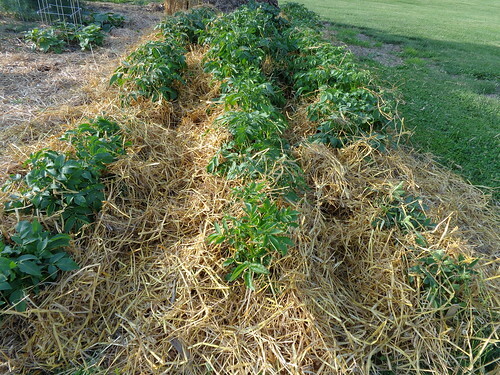 I plan to cover the potatoes with maybe 6 inches of garden soil/compost and then put straw or hay on top of the bed. Rabbits never messed much with our potatoes; they went more for other things (chard!). If that's all you've got, though, it may look good to them. That being said, I haven't grown in raised boxes, either. Good luck with however you do it. We're growing potatoes at our new place and hopefully the rabbits won't be any more of a problem than they already are! I grow my potatoes on top of straw and them mound more straw on top as they grow. I have lots of rabbits in my area and have to fence in many of my crops but the potatoes are unfenced and the rabbits have never bothered with them. Any soil in between the straw layers brownrexx? I am putting in a brand new raised bed (4'x8')and was thinking a few inches of top soil at the bottom. Plant potatoes on top of that and cover them with maybe 4-6 inches of good compost/soil. Was thinking 4-6 inches of straw on top of the soil would be fine and should be able to avoid hilling completely. Any thoughts on this idea Maybe I can substitute straw for the topsoil? I grow my potatoes completely in straw and the reason is to avoid scab which is a fungus and the spores live in the soil. If you go completely with straw you need to keep it very deep to block out all of the light from the tubers as they develop or they will turn green. Those are some beautiful spuds, Brownrexx! Snowshoe hares are the rabbits here, and although I haven't done any large scale potato growing at this location there are usually one or two small potato patches every year, and they have never been touched by the hares. The foliage is toxic afaik, and iirc my Dad said so as well, animals won't touch potato plants. These hares will mow down anything else if it suits them. Bower, I have only seen snowshoe hares on TV but they appear to be 2-3 times the size of our little bunnies. Old School since you are also in PA your bunnies probably like to eat the same things that mine do. I have half of my garden fenced with chicken wire because the rabbits will eat beans, peas, lettuce or other greens and carrots. I have even had them nibble the tops of onions but when other plants became plentiful they quit eating those. I grow tomatoes, peppers, squash, radishes, corn and potatoes in the unfenced parts with no problems BUT I have had them eat pepper seedlings so I have little wire cages that I put around them when they are small and after they grow a bit the rabbits leave them alone. As for nutrients for the potatoes - I only use a real thin layer of straw on the bottom or even none at all and the roots grow down into the soil where the nutrients are found but the potatoes develop off of the stems of the plant which are above ground and under the straw. This keeps the tubers (potatoes) out of the soil where the spores are. Scab is naturally occurring in the soil and non toxic to us but it looks ugly on the potatoes and makes corky rough areas on the skin. I especially have trouble with this on the red potatoes. I have tried crop rotation and lowering the pH to no avail so using straw and keeping them out of the soil entirely works best for me. I garden organically so using fungicides is not an option. Last edited by brownrexx; February 25, 2018 at 01:48 PM. I can only add that when I was a kid my pet rabbits like to graze inside a 1 foot pen. When tempted by the morsels outside the fence, one jumped out, leaving the other behind. Ginger snap never jumped out. The other always did. Brownrexx, those spuds look great! I grew up helping my dad in the garden, and I seemed to land most often in the potatoes, beans, peppers, or corn. (Now I wonder why my Dad was always in the tomato and melon patches! ) 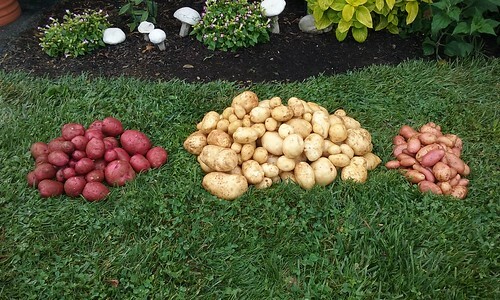 Only ever having grown in the ground, I'm reading your post with great interest; the soil of my childhood was quite acidic, but here it's sweet and we also have EB, so these potatoes may face alot more challenges. The newly dug potato bed is probably 75' from the nearest tomatoes, and I'm not sure if that will help much but I'm sort of expecting to see EB, if not the first season then the next. But now I'll be watching for rust as well. Old School, I did not know that deer would chow down on sunflowers! Do potatoes get EB? I have never seen it. They do get Late Blight but I grow earlier varieties and harvest them before late August when LB hits in my area so it's not usually a problem for me. Colorado Potato beetles are my main problem and I hand pick them daily. It doesn't take long and I am in the garden every day anyway so I just squish the larvae or eggs while wearing my garden gloves. This works pretty well but if it gets ahead of me usually one treatment of Spinosad gets them under control for the season. I have used sulfur on my garden to lower the pH in the past. I keep my potatoes away from my tomatoes as well. I don't know; I guess I assumed that if they get LB, they could get EB We never had EB until this home, that i can recall. Maybe it's nothing, then - that would be nice! I saw two or three Colorado Potato Beetles last year, on the squash - may have been the same one? - so I know they're here. We have tons of squash bugs and do the same as you, but haven't used Spinosad or anything on them. No matter how many eggs I squish, they always eventually win but that's okay. So far we've harvested more than we can eat ourselves, regardless. I have thought of applying some sulfur, especially in with these potatoes, but so far everything seems to be doing well (this is only the third full season here), and I want to wait and see what does what with what's already here...if that makes sense, lol.